As the Rock & Roll Hall of Fame says, "Before the world heard of KISS, the New York Dolls, Marilyn Manson, or Ozzy Osbourne, there was Alice Cooper, the original shock-rock band." When Alice Cooper became the stuff of legend in the early '70s, their shows were monuments of fun and invention. Riding on a string of hits like "I'm 18" and "School's Out," they became America's highest-grossing act, producing four platinum albums and hitting number one on the US and UK charts with Billion Dollar Babies in 1973. Their utterly original performance style and look, known as shock rock, was swiftly copied by countless bands. Dennis Dunaway, the bassist and cosongwriter for the band, tells a story just as over-the-top crazy as their (in)famous shows. 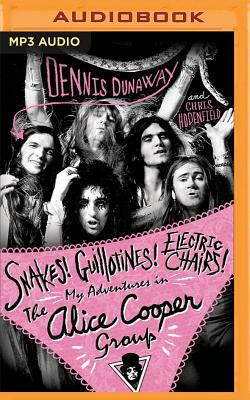 As teenagers in Phoenix, Dennis Dunaway and lead singer Vince Furnier, who would later change his name to Alice Cooper, formed a hard-knuckles band that played prisons, cowboy bars, and teen clubs. Their journey took them from Hollywood to the ferocious Detroit music scene, along the way adding new dimensions of rock theater. From struggling for recognition to topping the charts, the Alice Cooper group was entertaining, outrageous, and one of a kind. Snakes Guillotines Electric Chairs is the riveting account of the band's creation in the '60s and strange glory in the '70s and the legendary characters they met along the way.